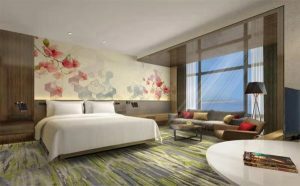 On December 31, 2018,Hilton (NYSE: HLT) announced the opening of Hilton Garden Inn Zhuhai Hengqin, the first Hilton property in Zhuhai, Guangdong Province. The latest addition to Hilton’s portfolio of 15 world-class brands is a 13-story, 158-room, focused service hotel that is just minutes from Orient Golf Club, Hengqin International Tennis Center and Sumlodol Hengqin Camping Park. As part of comprehensive brand refresh, the hotel is designed to build on the brand’s commitment to anticipate and cater to the evolving needs of China’s travelers. Hilton Garden Inn Zhuhai Hengqin is owned by Zhuhai Da Heng Qin Innovation and Development Co. Ltd and managed by Hilton. Hilton Garden Inn Zhuhai Hengqin lies in the heart of Hengqin New Area. As a Special Economic Zone, Hengqin has been named a part of the China government’s “Belt and Road” Initiative, making it an international center for commerce, tourism, education and new technology industries. The hotel is the nearest international brand hotel to Chimelong Ocean Kingdom and Hengqin Port, which is only 8 kilometers and 10 kilometers away respectively. Hilton Garden Inn showcases three dining options offering an array of cuisine. The all-day dining restaurant, Garden Grille, offers a delicious international buffet spread for breakfast, lunch and dinner, as well as an a la-carte menu and in-room dining service. Guests can pick up snacks at The Shop, a 24/7 grab-and-go concept offering sundries, an assortment of beverages and ready-to-cook meals, or relax and unwind over cocktails or afternoon tea at Garden Bar, the stylish lobby lounge with magnificent views of the river. In each of the 158 digital-key enabled guest rooms, including 3 deluxe suites and 18 premium rooms, the guest experience is enhanced with Hilton Garden Inn’s signature bedding and linens – fresh, white cozy duvets and crisp linens with plush hypoallergenic pillows that provide the best quality rest possible, a 49-inch flat screen high definition TV and Crabtree & Evelyn amenities. Business travelers will find extra convenience and comfort with the generous workspaces comprising a large working desk, adjustable lighting and an ergonomic chair. Guests can also enjoy complimentary high-speed Wi-Fi throughout the hotel, and relax at the indoor swimming pool or 24-hour fitness center. With over 1,000 square meters of meeting space, Hilton Garden Inn Zhuhai Hengqin offers ample space and amenities for weddings, business meetings and social gatherings, including 5 function rooms and a spectacular garden terrace. The stunning 554 square meter pillarless ballroom with a 10-meter ceiling can accommodate up to 450 guests. Hilton Garden Inn Zhuhai Hengqin is part of Hilton Honors, the award-winning guest-loyalty program for Hilton’s 15 world-class brands. Members who book directly have access to instant benefits, including a flexible payment slider that allows members to choose nearly any combination of Points and money to book a stay, an exclusive member discount, free standard Wi-Fi and the Hilton Honors mobile app. To celebrate the hotel’s opening, Hilton Honors members will earn an additional 1,000 Points per night for bookings from January 10, 2019 to July 9, 2019, when booking directly with Hilton. Hilton Garden Inn Zhuhai Hengqin is located at Buliding 2 Hengqin International Innotech Center,No.398 Houpu Road, Hengqin New Area, Zhuhai, Guangdong, China, just 50 kilometers away from Zhuhai Jinwan Airport.